This third one is in particular useful to overcome the time you cannot use a crashed system. You should never trust any backup software where you cannot verify it is operating with your specific systems, and not just try out the part that does the backup but also test the restore. Unfortunately doing a full restore requires at least an extra disk of the same size, thus the following table provides some ideas on how you can verify it does what it is supposed to do without going that last mile. Just select the backup image you assume to contain the files you deleted or modify, then click the "Mount" button on the Restore tab, while you are in the local area network or connected via a VPN. Windows explorer will open and display one of the volumes of your backup. Note that the backup is mounted with write authorizations as this is required to resolve signature conflicts and also allows to change authorizations in case you need to access files of another user. However the changes are of course not written to your backup but to a delta on the local system. Search the files you are missing. When done, just eject any of the volumes. I don´t know how to make that easier to use, except by looking into how to tell you when you last changed a specific file.. There are essentially two options: you restore using an external drive, or you use Windows To Go. Unlike other backup software, Lindenberg Backup does not use a Preboot Execution Environment, which is hard to get running accross a variety of hardware. remove the internal drive from the broken system (optional) - can be skipped in case you want to restore to a new drive. License and Tools: Windows To Go (WTG) is a feature included with Windows Enterprise (and Education), and even though the creation applet is included in Windows 10 Pro (see also https://www.thurrott.com/windows/windows-10/90295/ask-paul-windows-go-coming-windows-10-pro) you still need an Windows Enterprise image. Using command line or third party tools it is however possible to also create WTG using Windows Pro images. If unsure, get an evaluation version from Windows for Business, valid for 90 days, and create from there. Otherwise you may want to check out "4 Tools To Create Windows To Go USB Of Windows 10"
Drivers: WTG includes drivers that support a large variety of but not all hardware. Missing drivers can be added from your backups if necessary, see above. Performance: You definitely need a fast USB drive or stick, preferably using USB 3.0 or higher. I tried with an old USB stick lying around and it just sucked. "Certified for Windows To Go" is however not a must, depending on the tool you are using. Depending on the target windows version and the tool, your drive/stick must have at least 16GB, with 64GB you are on the safe side for any tool. This is based on my experiments with virtualizing backups. Except for the generation, all of this can be changed easily afterwards as needed, and of course I am interested in feedback of what works or not. Performance obviously is not as good as the original machine, in particular if your original is using a solid state disk (SSD) and the virtual machine is running from a real hard disk. As with any Windows system, startup time is much faster with a SSD. You can likely get significant better startup performance by converting the chain of backup virtual disks into a single dynamic virtual disk, store that on a SSD, and start a virtual machine using that copy. I am planning to address this in an upcoming version of Lindenberg Software Backup. 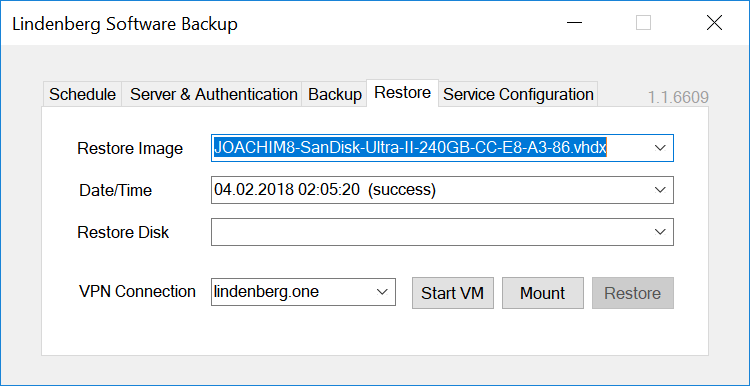 After creation of the virtual machine on the server, Lindenberg Software Backup will start a user interface on the client connecting to the virtual machine. Unfortunately the choice of user interface is tricky as none of them addresses all use cases, therefore I am giving an overview of those Remote Desktop Protocol (RDP) clients I experimented with or am using. In principle, any RDP client supporting Hyper-V connections (port 2179) should do. For audio redirection, Enhanced Session Mode is required and Remote Desktop Services must be enabled in the virtual machine. VMConnect VMConnect is part of Hyper-V Management tools. In my opinion, VMConnect is providing the best user experience, in particular fast screen updates, resizing, audio redirection, and the capability to change virtual machine settings, but requires the client user to be a member of the Hyper-V-Administrator group and is thus not adequate for non-administrative users. It also is cumbersome to use if the client system is not member of the same domain as the server. FreeRDP FreeRDP is an open source solution that provides a cross platform client for Remote Desktop Protocol (RDP). FreeRDP does not require the user to be a member of the Hyper-V-Administrator group, i.e. VMConnectAccess permission is sufficient. As the command line of FreeRDP is somewhat difficult to use: a typical invocation looks like wfreerdp.exe /v:tom.samba.lindenberg.one /u:joachim /p:*** /vmconnect:6fcf01b7-b29e-43a0-9556-f7e0c77a226e;EnhancedMode=1 /audio-mode:0. However I was unable to get audio redirection to work with any windows version of FreeRDP I tried, despite support of enhanced session mode. Guacamole Guacamole is an open source solution based on FreeRDP above that provides a solution to access your virtual machines from any browser - including audio redirection. 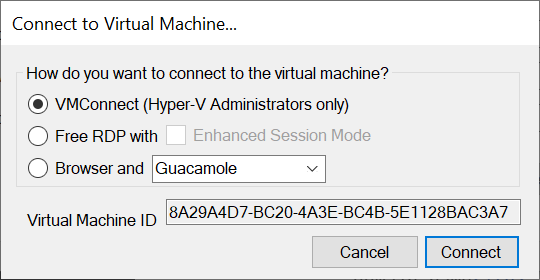 See Guacamole Integration for details. Royal TS Royal TS is a Remote Desktop Protocol (RDP) (and other protocols not relevant to Hyper-V) client that leverages the RDP control from Microsoft and thus provides user experience similar to VMConnect but without requiring the client user to be a member of the Hyper-V-Administrator group. Be sure to configure enhanced session mode for audio redirection to work. Remote Desktop Plus does not yet support Hyper-V instances. After creating or starting a virtual machine, Lindenberg Software Backup monitors usage of your virtual machines - to be precise, Remote Desktop Protocol connections on port 2179 - and as soon as they are not used it will suspend the virtual machines in order to conserve memory. Configure backup for verification, turn on "Keep shadow copy for verification"
Turn of "Keep shadow copy for verification"
Backup stores traces in the directory "C:\ProgramData\Lindenberg Software\Backup\Traces". Locate the most recent one staring with "SYSTEM" (the user running the backup). Open it. Within the trace search for "start backup scan on shadow". At the end of the line there is the name of the shadow copy, something like "\\?\GLOBALROOT\Device\HarddiskVolumeShadowCopy84". There may be multiple depending on the number of volumes of your disk. The drive letter or volume id the shadow copy belongs to is shown before the shadow copy name. When entering a shadow copy name as a directory be sure to add a trailing '\'. (optionally) use mklink /j <somelocationonyourdisk> <shadowcopyvolumeid>\. The shadowcopyvolumeid is the "\\?\GLOBALROOT.." path shown in the output of vssadmin, and you must add an additional backslash to it. somelocationonyourdisk should be a directory path plus the name you want to use to refer to the shadow copy. This step is optionally as it helps you to browse the images within the specific shadow copy, but alternatively you can also use a direct path into the shadow copy when comparing - just be sure to have a trailing '\' at the end of the shadow copy name. 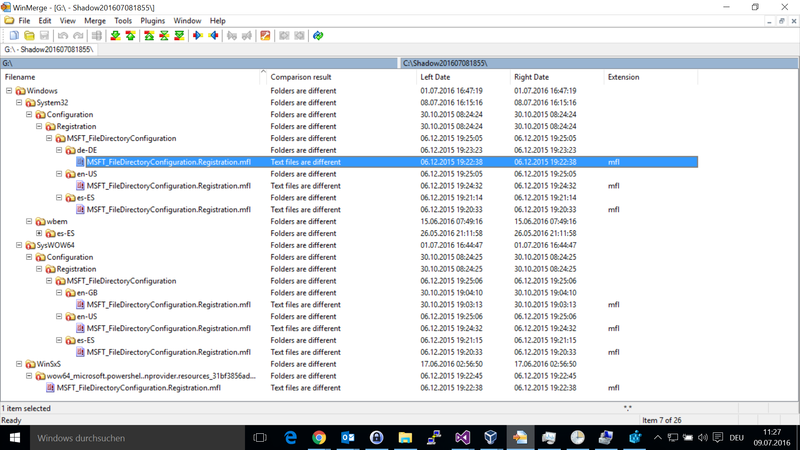 First of all, WinMerge only shows differences in the Windows directory - nowhere else on the volume. Second, the differences reported do not really exist, if I compare the files individually, they are the same.